Noida: “Our Country has highest youth population in the world and every youth want jobs. Coming generations will not forgive us if urgent steps are not taken in the direction of employment generation”. 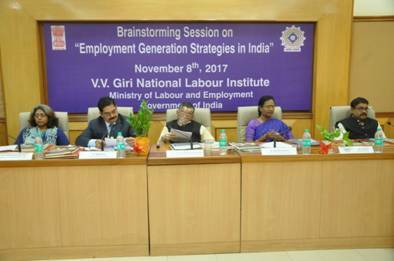 These views were expressed by Shri Santosh Kumar Gangwar, Union Minister of State (I/C) for Labour & Employment, while addressing the experts in a brain storming session on employment generation strategies organized by VV Giri National Labour Institute (VVGNLI) in Noida today. He said our Ministry do not directly creates employment but creates suitable environment to facilitate employers and employees. He further added that our government and Ministry are moving in right direction on the path to skill development and employment generation. He also referred to the historic decision of Demonetisation which has yielded lot of good results during the last one year. Shri Gangwar said beneficiaries of EPFO and ESIC have increased to one crore in the last one year. At the occasion Shri Gangwar also released four publications published by VVGNLI and inaugurated the renovated seminar block of the institute. Secretary, Ministry of Labour and Employment, Smt. M. Sathiyavathy said that 10 million youngsters are added every year in the race to search a job. Unfortunately, many youngsters are lacking skill to get a job in the market. She added that government is constantly trying to fill up this gap. About 1.17 crore youth have been trained in various skills in recent past and 920 job fairs were organized to get these youths placed in industries and institutions. Referring to the important legislation of 26 weeks of maternity leave to pregnant lady workers, she said that many employers are not willing to give this paid leave of 26 weeks. Experts should suggest remedies regarding this also, she added. Director General, VVGNLI, Dr. H. Srinivas welcomed experts from ILO, NITI Ayog, University of Delhi, Institute of Human Development, Ministry of Agriculture and WCD and other institutions and expressed the hope that some fruitful, practical suggestions will come from the exercise and can be handed over to Ministry of Labour and Employment for further consideration and implementation.